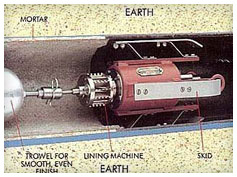 Call or email us for more information on how cement lining and pipeline rehabilitation can help you. /// LCPP, global specialist in Cement Lining. Contact us for expert advice. Leverton Consulting, based in North America, and trans-Atlantic British based Proline Ltd are global specialists in large diameter pipe lining, cement lining (cement mortar pipe lining), pipeline cleaning, pipe relining, and pipeline rehabilitation. By bringing together two highly respected companies we can offer most aspects of pipeline protection domestically and globally, including general pipe line repair to cement lined pipe, Epoxy Resin lined pipe and potable water pipes. We have successfully lined hundreds of thousands of meters of pipe with both cement mortar lining and epoxy resins, in-situ, stockyard and factory lining. Our intention is to provide clients with a comprehensive service offering the most cost effective pipeline rehabilitation and continued protection with minimal disruption to local services. From initial consultation to contract completion. » you are responsible for the maintenance of existing water carrying pipelines. If either of the above apply to you - please do not hesitate to contact us - we will resolve any problems to your complete satisfaction. As early as the 1860's and until the 1950's spun cast iron pipe was the material of choice for the distribution of potable water in cities, towns and rural areas. After the 1950's the pipe was generally made of steel until the introduction off ductile iron in the late 1960's. The majority of individuals are aware that cast iron and steel are ferrous materials so when water is introduced into cast iron or steel pipes you initiate a process of corrosion. 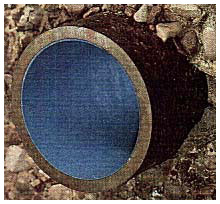 As the pipe wall is attacked by water and oxygen, tubercles begin to protrude from the pipe wall and start to decrease the pipe wall thickness thus reducing the internal pipe diameter, which in turn reduces water flow and drastically increases pumping costs and adds to the likelihood of the pipe bursting. As the tubercles get larger they capture mineral deposits that are suspended in the water, these build up with the tubercles and reduce the internal pipe diameter even further. The solution is to contract PROline to help you choose the most suitable internal coating for your new or old pipe and let us apply it for you. To achieve this, we aim to give a single-minded commitment to meet customers' requirements effectively, efficiently and professionally. The success of PROline is dependent on this strategy.